Bratislava [Братислава; Bratyslava]. City (2013 pop 462,603, including about 2,000 Ukrainians and Ruthenians) on the left bank of the Danube River; capital of Slovakia. 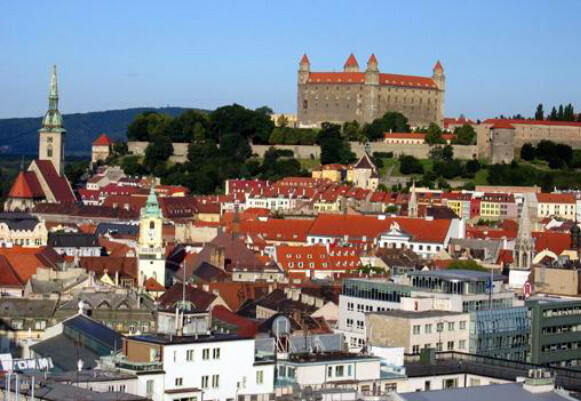 After 1920 a small Ukrainian colony arose in Bratislava. The Prosvita society and later the Association of Ukrainian Engineers in Slovakia and the students’ club Beskyd were organized there. The Commercial Academy, which was evacuated from Transcarpathia, functioned in Bratislava in 1939–40. In 1945 a Greek Catholic parish was established in the city. In the 1960s the Ukrainian section of the Slovak Pedagogical Publishing House began publishing books for the Ukrainian population of the Prešov region. In 1970 the Taras Shevchenko Music and Drama Club was set up. The Ukrainian scholars in Bratislava Mykhailo Molnar and Mikuláš Nevrlý have been associates of the Slovak Academy of Sciences.